Experienced Bull Breed Owners OR Previous Fostering Experience Homes for Fostering Wanted! 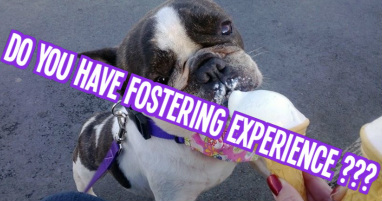 We are seeking experienced short-term foster homes, FBRGB needs foster homes with French Bulldog or other flat-faced, bull or terrier breed experience and/or dogs with behavioural issues. We do not pick and choose which dogs come in to rescue but we would be sympathetic of your home circumstances (cats, small children etc.) You will however need to have the room to be able to separate the dog from your own animals for at least the first week if not the whole of the fostering period due to temperament issues that the dogs can come in with. Please be aware though that we do not allow any fosterer's to adopt a dog in their care within the first year of fostering for the rescue. Fostering a dog means bringing the dog into your own home for a period of time to offer love, understanding and training. During this time you will also be assessing the dog for re-homing. Your role as a fosterer will be to assess the dog’s ability to cope with everyday family life and situations. The dog may be nervous or over-confident. He or she may have limited house-training or no basic training skills. They may be expert bin raiders. They may hate cats. They may not be used to lead walking. A fostered dog may be with a carer for a short time, or for several weeks or months. This will depend on how soon the dog is assessed as ready for re-homing, and whether there is an enquiry from a home that is suitable. FBRGB re-homing policy states that all dogs will be neutered, Vaccinated and microchipped, and all potential homes are vetted thoroughly.